On a late summer day in 1995, Stuart Wolf arrived for work at the Advanced Research Projects Agency with a 40-pound, radiation-hardened memory cabinet that engineers at the Naval Center for Space Technology (NCST) had taken out of a satellite they were assembling at the Naval Research Laboratory (NRL). They “put it in a box, and I actually took it to DARPA,” recalled Wolf, a physicist who then was splitting his time as a program manager at ARPA (soon to get a “D” for defense in front of its acronym) and materials scientist at NRL. It helped that Wolf was friends with the NCST director at the time, who let him borrow the 128 kilobyte, quarter-million-dollar memory box. I plopped the memory on Gary Denman’s desk,” Wolf said, referring to the ARPA director at the time. “I promised him I would replace that memory with a chip that weighed a fraction of an ounce. He approved $30 million dollars, at that meeting, to start this program,” Wolf said during an interview earlier this year at DARPA headquarters in Arlington, Virginia. That was the moment when the Magnetic Materials and Devices program went from a glimmer in a program manager’s eye to the first of a series of well-funded DARPA programs that later would become recognized as central to one of the great physics-to-technology arcs of our times. Within a year of that moment, a synergy of physicists, materials scientists, electronic engineers, computer scientists, and others were bonding into a new scientific research and technology development community spawned from the most fundamental discoveries about electronic behavior with roots extending into the 19th century, noted historian of technology Patrick McCray of the University of California, Santa Barbara. In the context of space, the promise of smaller memory technology potentially also meant lighter and less power-needy technology, all of which could amount to a so-called SWaP victory, in which SWaP translates to “Size, Weight, and Power.” For many DARPA programs and their proposed technologies, the lowest measure of each of those traits often has been the metric of success. In planning the program’s first-year review, Wolf had a linguistic epiphany that had a rare combination of being scientifically spot-on and public-relations gold. Rather than using the drab name of the program – Magnetic Material and Devices – to identify the review, Wolf glommed onto what then was one of the field’s hottest topics, a set of phenomena known as spin transport electronics. Wolf shortened that quantum-mechanics-based phrase to spintronics, which he used in the name of the program review. Wolf’s neologism caught on, becoming the name that stuck for a broad swath of electron-based behaviors and technologies as well as the field devoted to their study and development. In the context of space, the promise of smaller memory technology potentially also meant lighter and less power-needy technology, all of which could amount to a so-called SWaP victory, in which SWaP translates to “Size, Weight, and Power.” For many DARPA programs and their proposed technologies, the lowest measure of each of those traits often has been the metric of success. First for some of the basic physics. In 1857, William Thompson (a Belfast-born physicist known more regally as Lord Kelvin) observed that a magnetic field could cause changes in an electrical conductor’s resistance, a phenomenon that became known as magnetoresistance. One hundred and fifty years later, in 2007, Albert Fert and Peter Grünberg shared a Nobel Prize in physics for their independent discoveries in 1988 of what became known as giant magnetoresistance (GMR). In their respective laboratories in France and Germany, the researchers both observed unexpectedly large magnetoresistance effects in materials made of alternating layers of magnetic and nonmagnetic metals. Airman 1st Class Nick Fazio verifies the status and configuration of the 96th Communication Squadron’s data center equipment at Eglin Air Force Base, Florida. 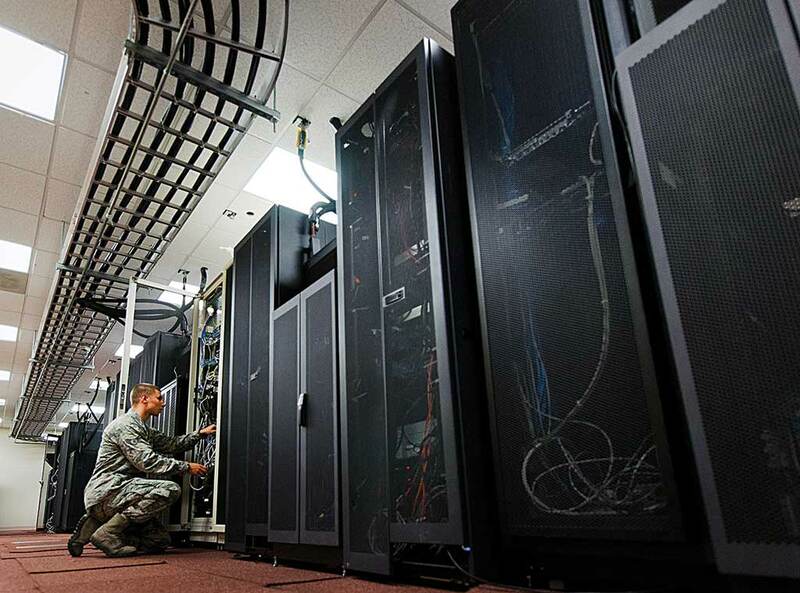 Approximately 40 airmen and civilians are responsible for the connectivity of the base’s more than 19,500 user workcenters. DARPA spintronics research enabled transformative technologies that have become the backbone of data storage today. U.S. Air Force photo by Samuel King Jr. The language of “spin” comes into all of this because magnetism depends on an electronic trait as fundamental as its electrical charge but that the quantum mechanical giants of the early 20th century – among them Paul Dirac and Wolfgang Pauli – thought of more like a spinning top. In the quantum mechanical framework, an electron can spin in one of two directions. Materials like iron and nickel, whose outermost electrons can assume spins primarily oriented in one direction because of a fundamental interaction between them (exchange interaction) are magnetic. Gold and silver and wood and most polymers are nonmagnetic. Within just a few years of the initial GMR reports in the late 1980s, Stuart Parkin and his colleagues, working at the IBM Almaden Research Center near San Jose, California, had exploited the GMR effect for an invention they referred to as a “spin valve.” And in 1997, IBM rolled out the first use of spin-valve sensors in the read head of its 16 GB Deskstar 16GP Titan hard drive. In subsequent years, the technology would ascend to blockbuster status as it became the workhorse of the multi-billion-dollar data storage industry. Like Grünberg’s and Fert’s Nobel Prize-winning GMR materials, the IBM team made its spin valves out of a pair of thin magnetic layers flanking a nonmagnetic layer. One of the magnetic layers had a magnetic moment (a measure of the net magnetic effect of the orientations of a material’s numerous electrons) that was pinned in a given direction or “fixed” and the other had a “free” magnetic moment that could be flipped. When the magnetic moments of the outer layers in these GMR structures align in the same direction, electrons move between them with less resistance (an open spin valve) than when the moments of the layers are not aligned (a closed spin valve). Because even subtle magnetic fields, such as those from tiny magnetically-encoded bits on a storage disk, can toggle the magnetic moment of a spin valve’s “free” magnetic layer, these GMR structures held great promise for new generations of read-head materials that could read data stored at much higher densities than before. Unlike the exquisitely controlled but impractical fabrication methods that the Nobelists used to make their GMR materials, Parkin and his IBM team from the get-go had in mind GMR materials made with easier sputtering techniques that their manufacturing brethren readily could apply on industrial scales. In 1997, IBM rolled out the first use of spin-valve sensors in the read head of its 16 GB Deskstar 16GP Titan hard drive. In subsequent years, the technology would ascend to blockbuster status as it became the workhorse of the multi-billion-dollar data storage industry. In Wolf’s early years at ARPA, beginning in late 1993, the agency was managing a well-funded “dual-use” program called the Technology Reinvestment Program (TRP), which the Clinton administration had begun a year earlier to forge stronger collaborations between military and commercial R&D sectors. This controversial policy stance about technology was a contributing factor that enabled Wolf to easily secure $5 million of seed money to organize what he called the GMR Consortium. Its members ranged from large and established research organizations such as Honeywell and NRL to nimble startups like Nonvolatile Electronics.